I used to be terrified of rheology. But we can't formulate PSA without it. So I've done my best to provide some key, app-based guidance, before we get on to the dreaded G' and G'' app. This is not intended as a course on rheology. 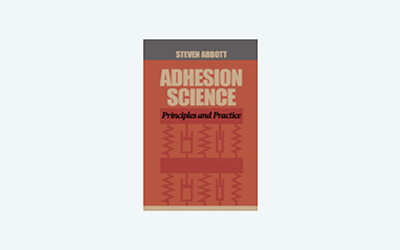 If you would like a quick guide then you can download the The Abbott Guide to Rheology The aim here is to "remind" you of some key issues that apply to PSA and, incidentally, to other aspects of coating/applying adhesives. The starting point is a pack of cards of height Y and with a force τ moving the top card with a velocity V. There is friction between the cards and the card on the bottom is immovable. For a given inter-card friction, the force τ will need to double if V is doubled for obvious reasons. It also has to be doubled if Y is halved because the velocity gradient, V/Y is much steeper so each card feels more of the influence of the fixed card. If the inter-card friction is called η then τ=η.V/Y. Now substitute "streamline" for card and we have the equation for the force required to push the surface of a liquid of thickness Y at velocity V. V/Y has units of (m/s)m = 1/s and is the "shear strain rate" which is given the symbol γ̇. Rheologists tend to call this "strain rate" and the rest of us call it "shear rate" or just "shear". Because shear rate is in s-1 and shear stress is in Pa (i.e. force/area = N/m2) then viscosity is in Pa.s. Different parts of your process create different shear rates and therefore different viscosities. It is easy to estimate the shear rate for any given process. Squeezing an adhesive at 5cm/s from a nozzle that is 0.5cm diameter gives a shear rate of 5/0/5=10 while the same adhesive being squeezed as a 10μm layer at 0.1m/s gives a shear rate of 0.1/10 -5=104. Enter the estimated shear rate and the relevant viscosity and shear stress are calculated. The reason some people use it is that they can provide a single number, sometimes called "P Ostwald", to use on, say, a product data sheet.